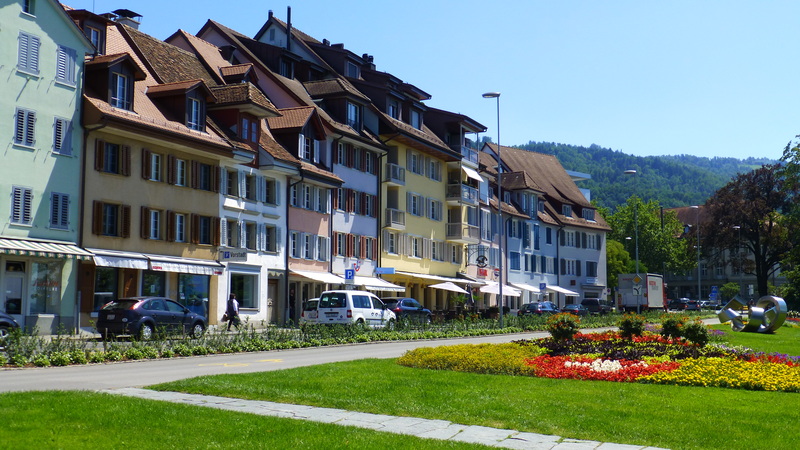 After our memorable morning visit and lunch in the old town of Zug, we made our way back to the new town to find the rail station once again. There was a definite change from old to new as we walked through the lake gardens. 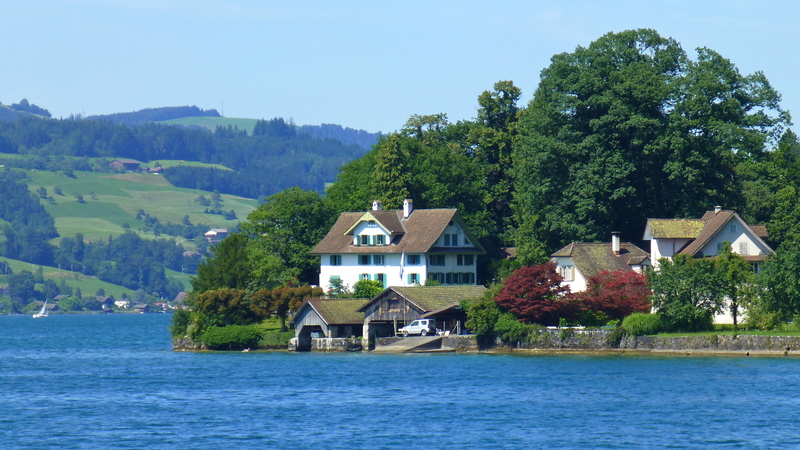 The last of the old town buildings of Zug at the back of the lake gardens. 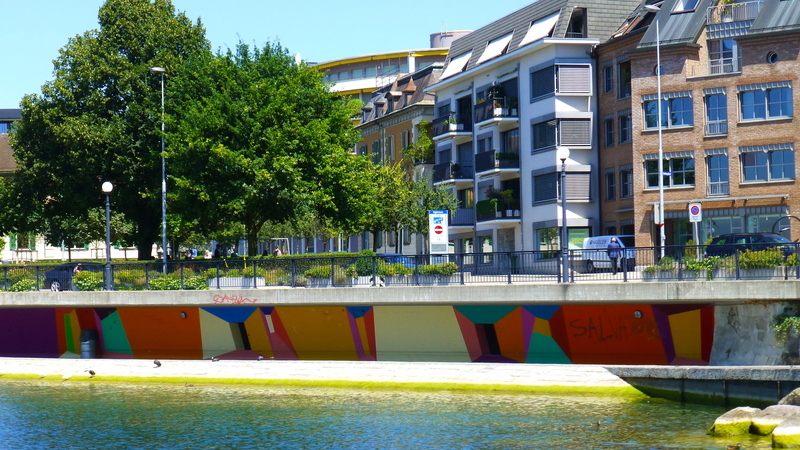 As the road swings away from the lake to go up to the rail station, the new town begins – complete with some abstract art and a little graffiti! The old rail station has completely disappeared. In its place this glass edifice. 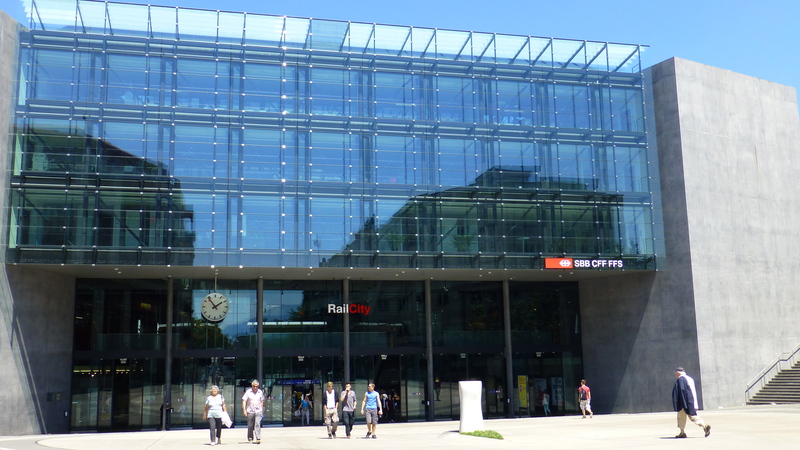 And it was there that we waited for our next train connection – to Lucerne – right on time! 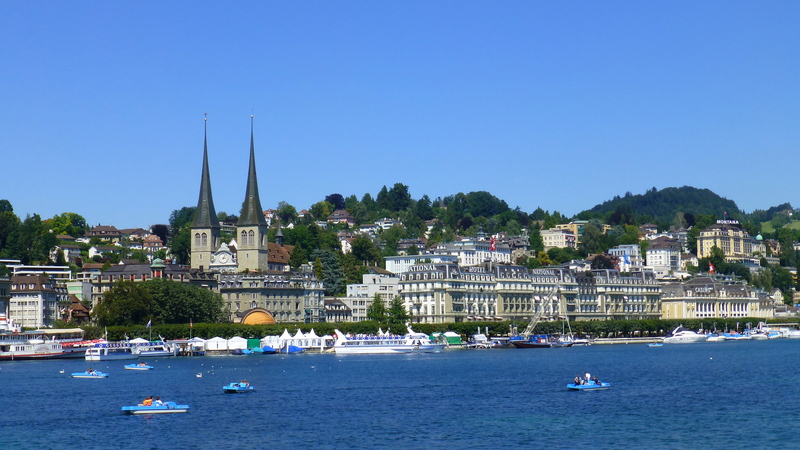 From Lucerne station we just walked across the road and caught a boat to take us to Vitznau. We could have taken a bus, but the scenery is great from the boat. 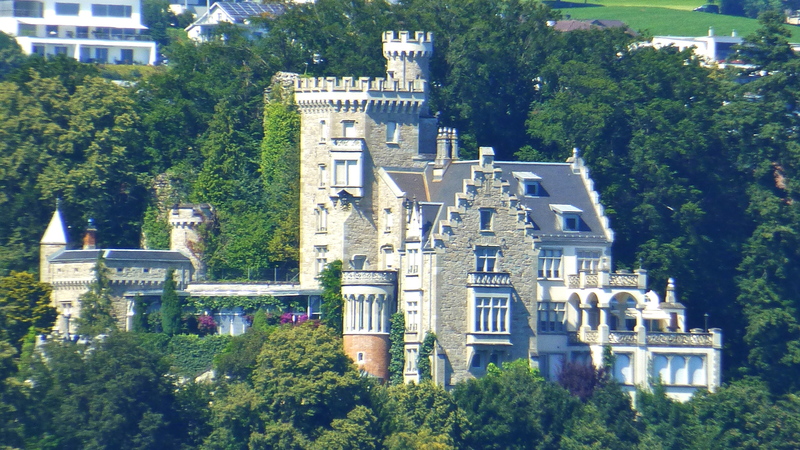 You get a nice view of the old Meggen Schloss from the boat. 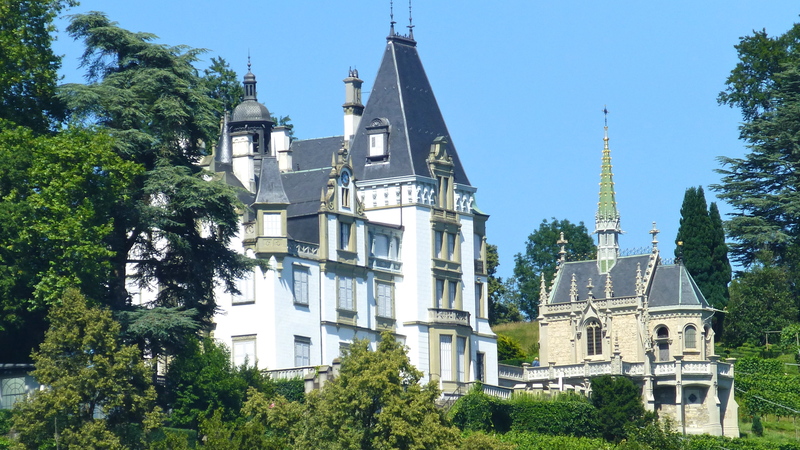 The Neuhapsburg Castle is a little crowded by new modern style buildings – but it’s still a beautiful sight. Some views on the lake seem to be timeless. This is the way I remember the lakeside. I’ve always loved the cute boat houses. But some of the waterfront is now a hotchpotch of the old and the new! Town planning seems to be a little lacking but I guess land is expensive (very) as are building costs (very,very) and everyone would like to live by such a beautiful lake if they can. I know I loved my life by the water at Lake Macquarie, near Newcastle! But the view from the water is not so good any more. 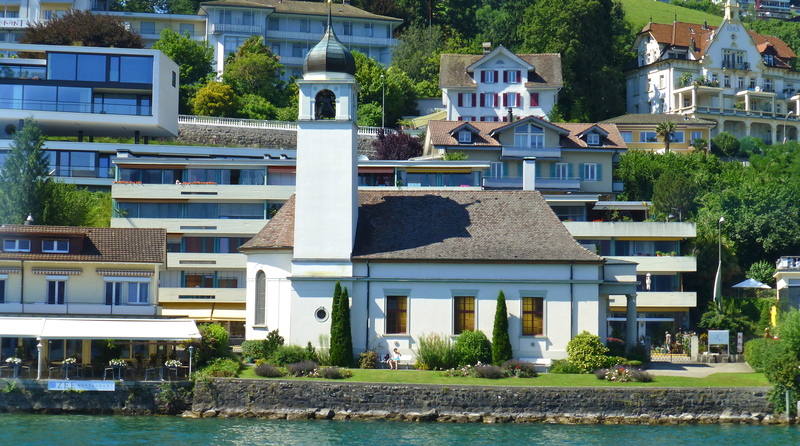 This section of waterfront clearly shows the two styles of architecture – traditional Swiss and modern Swiss! I wonder how long the new buildings will last – hundreds of years? I think not. And just what happens to snow on flat roofs? 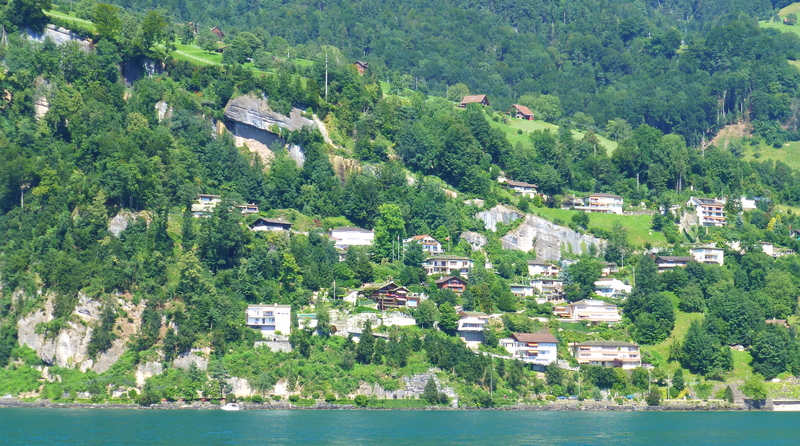 At Vitznau, houses have to find a niche on the rocky slope. 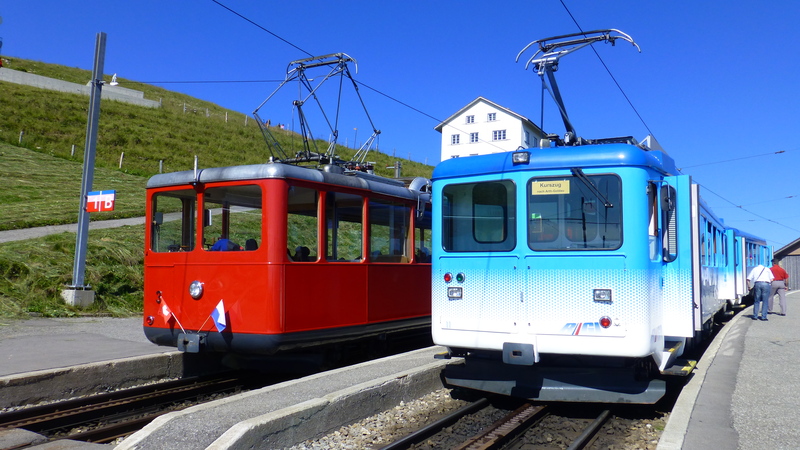 Our next train, the cog rail, would take us up that steep slope on its way to Rigi Kulm (to the top). 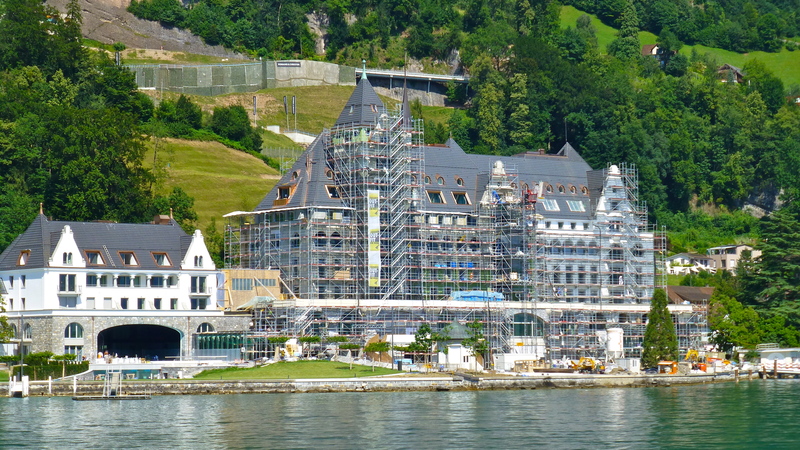 My favourite Palace, “The Park Hotel” at Vitznau, where I once stayed with Em for a conference, was covered in scaffolding. An Austrian interest has bought it and is now renovating the place. When I stayed here ( in 1980 I think) this was a mostly farming area and, while Em conducted the international conference, I walked the hills and meadows across farms and through forests. It’s all very different here now. 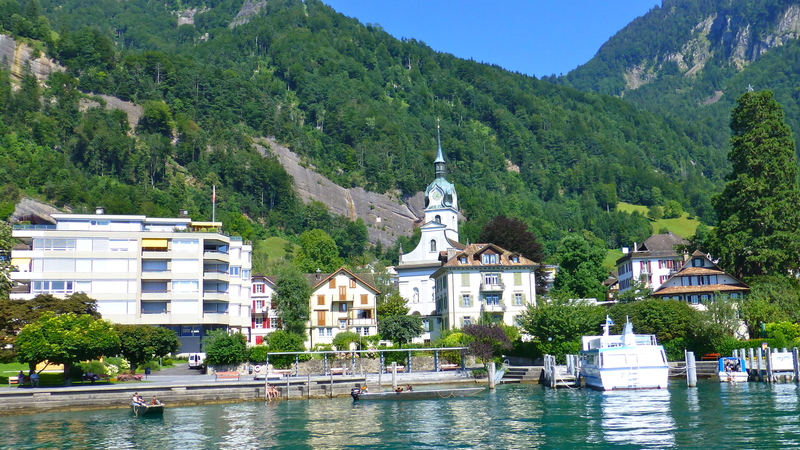 The tiny port of Vitznau has little room for modern development. The cog rail leaves from here and it was there waiting for the boat to dock – a seamless transfer. In no time at all we were going straight up the rocky incline with the engine pushing from behind giving us a grand view from the carriages in front. 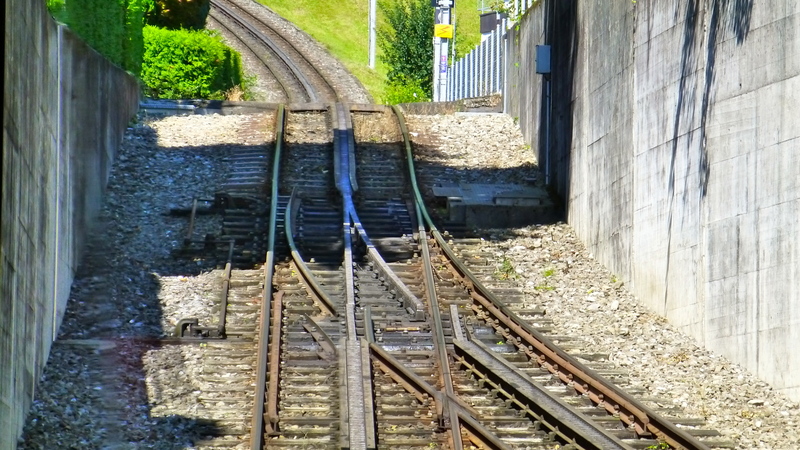 The track system for the rack and pinion railway. 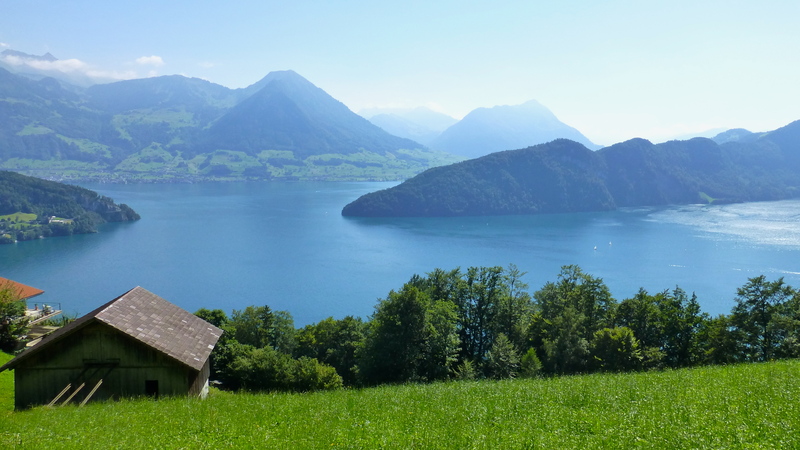 It was not long before we were a long way up above the lake on our way to the Kulm. Boats on the lake began to look like dots, only their wake giving there position. 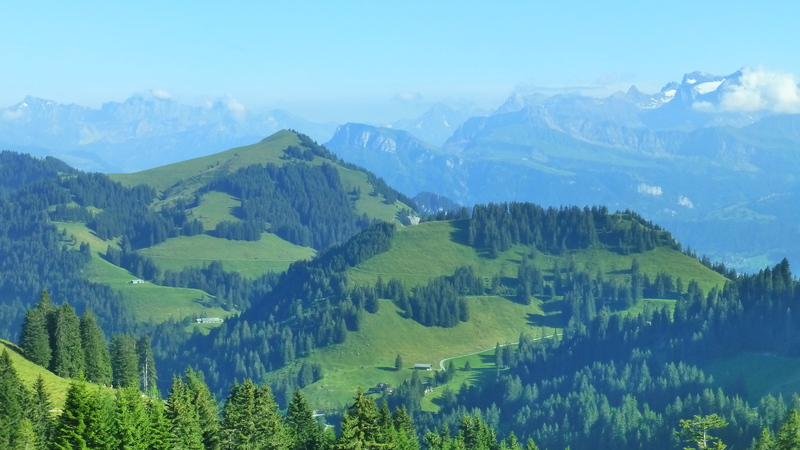 The wow factor increased as we went ever higher and began to see the Alps beyond the local hills. 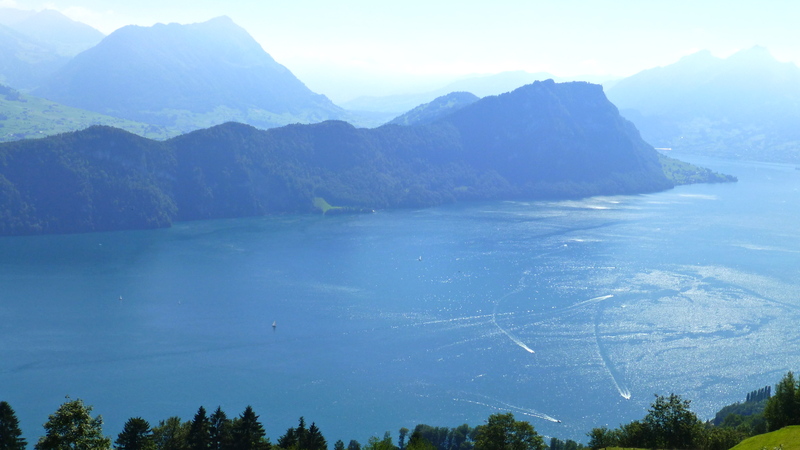 And then we turned a corner to climb up the other side of the Rigi. 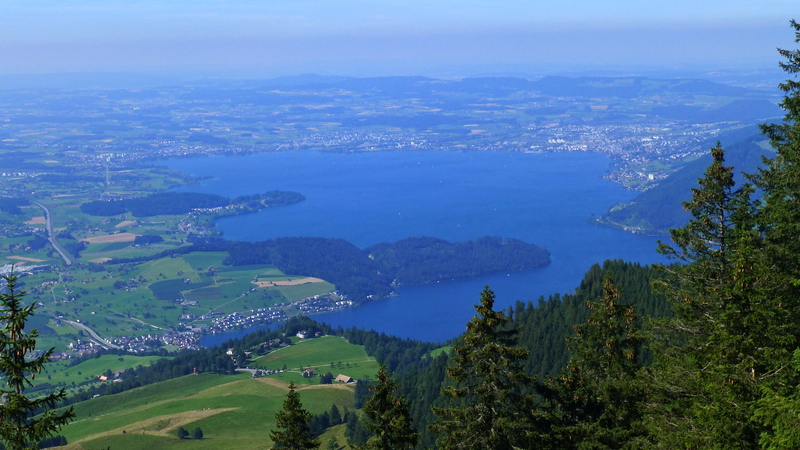 And far below us was the Zugersee and the town of Zug (top right) under a layer of smog that was never there when we lived in this area. Then the air was always crystal clear. At last we reached the station. 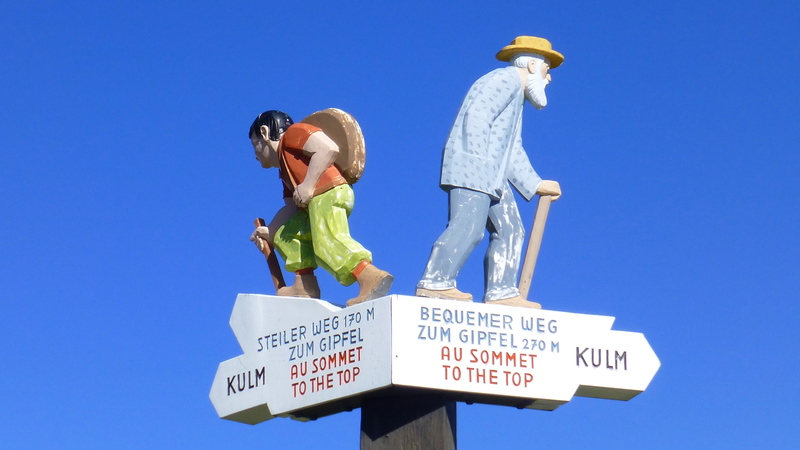 We had come up on the red train from Vitznau but would return on the blue train down the other side to Arth Goldau on the Zugersee..
Before we did that we still had to walk to the top. I loved this sign. No prizes for guessing my choice. I may no longer need a walking stick but I took the gentle grade… and enjoyed the view along the way. That’s why we had come. And what views they were! 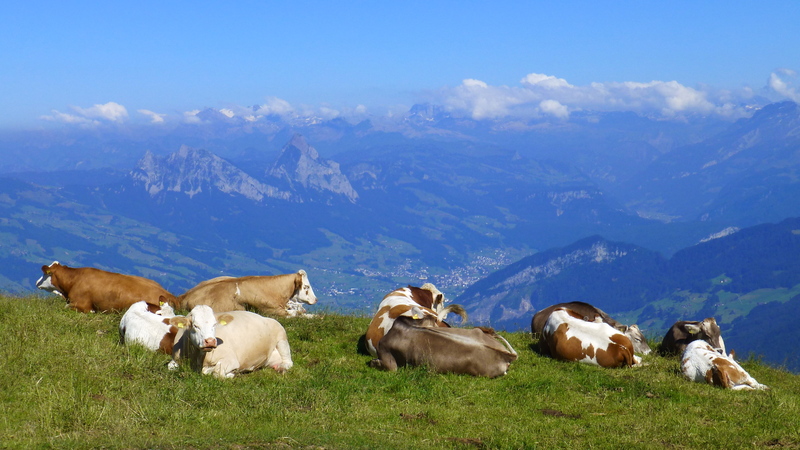 The cows know the right place to rest and chew their cud. They were looking down to where the blue train would take us on the way back down. 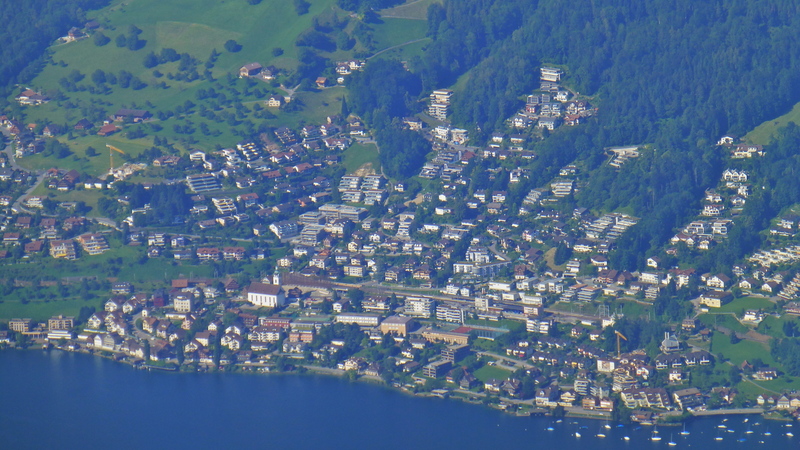 And a little further around we were looking down onto my old village of Walchwil. 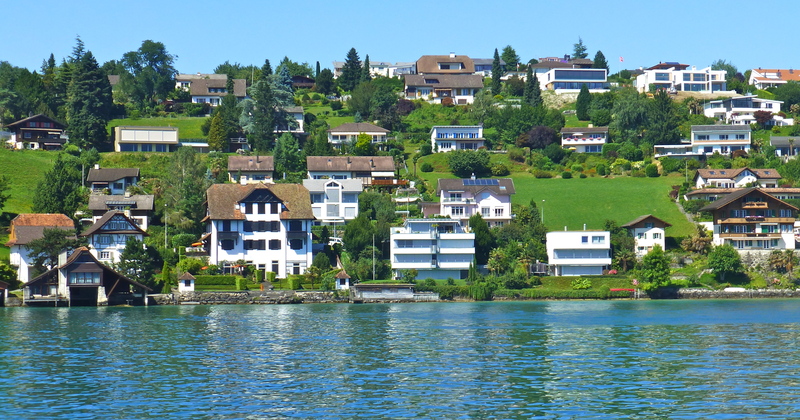 Then a tiny farming community – now the modern Riviera of the Zugersee! The old house we shared with a local family can be seen at the base of the very right hand ribbon of trees. A tiny brook runs through those trees and our house was called Unterbach – under the brook. The whole area was farms where I loved to walk. 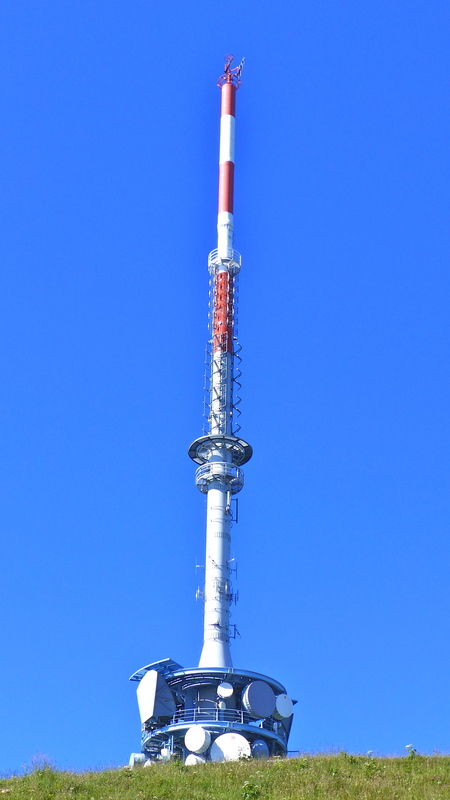 And right at the top of Rigi is a new tower for modern technology. But there has always been a tower here, it’s blinking red light kept me company on many a night when Em was away for days at a time travelling to other countries. On some of these high meadows, I first learned to ski. 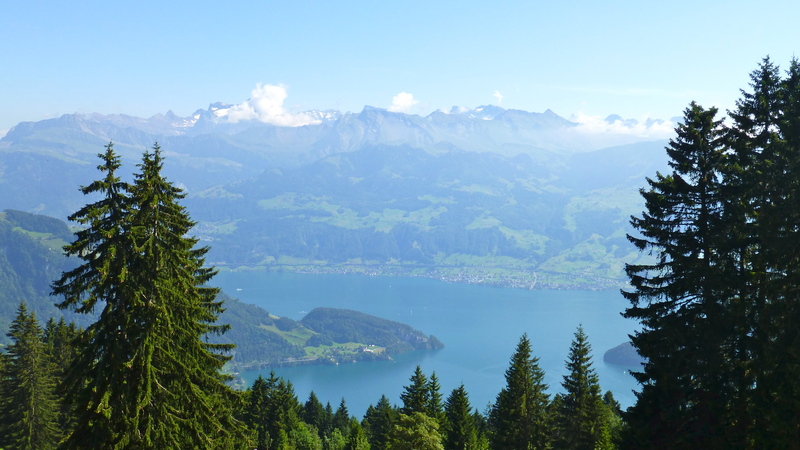 Rigi is wonderland in winter – but it is beautiful at any time of the year. 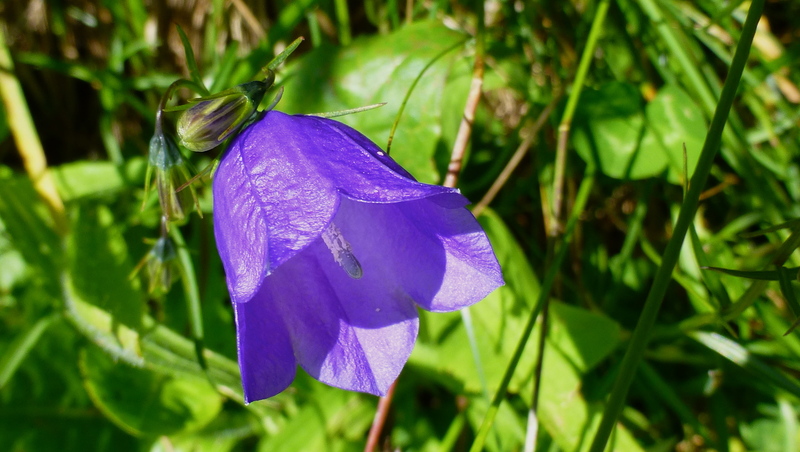 And while there is so much to see looking out at the expansive views, there is also beauty to found right at your feet beside the path… this harebell for instance. 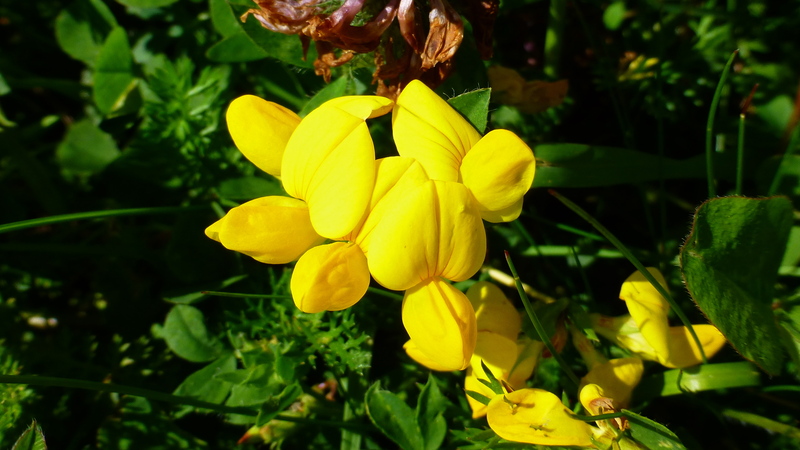 And I always delight in the tiny yellow vetch. 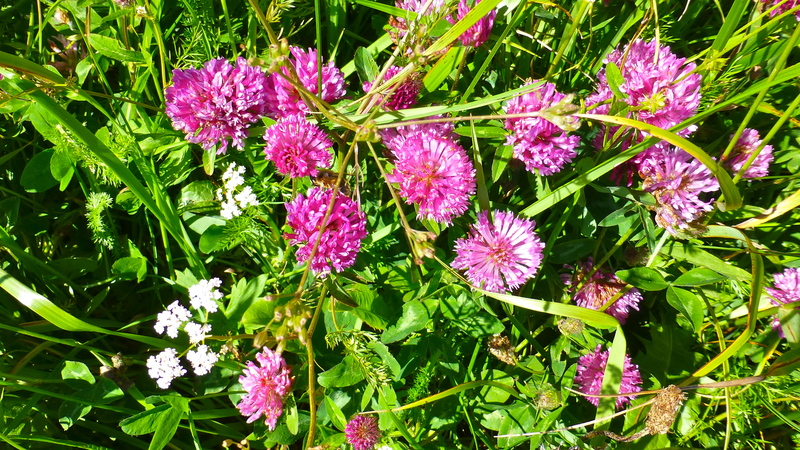 And for the cows to enjoy, there is plenty of sweet clover. 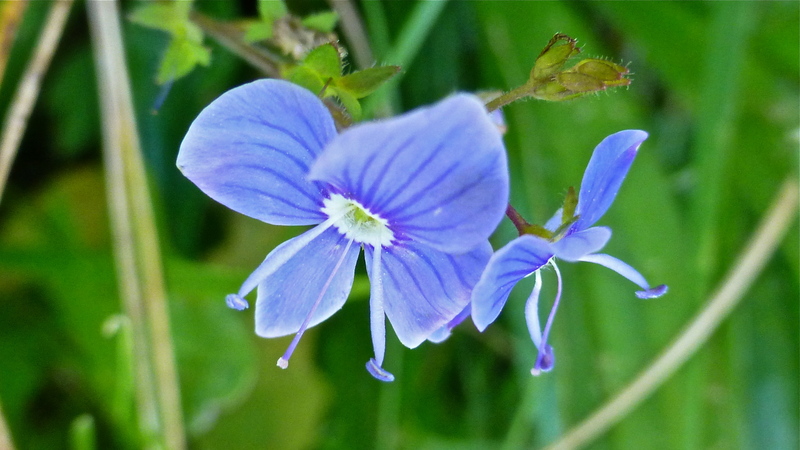 Tiny forget-me-nots. No, I will not forget and I am very grateful that I was able to make this special visit on a brilliant, sunny day. 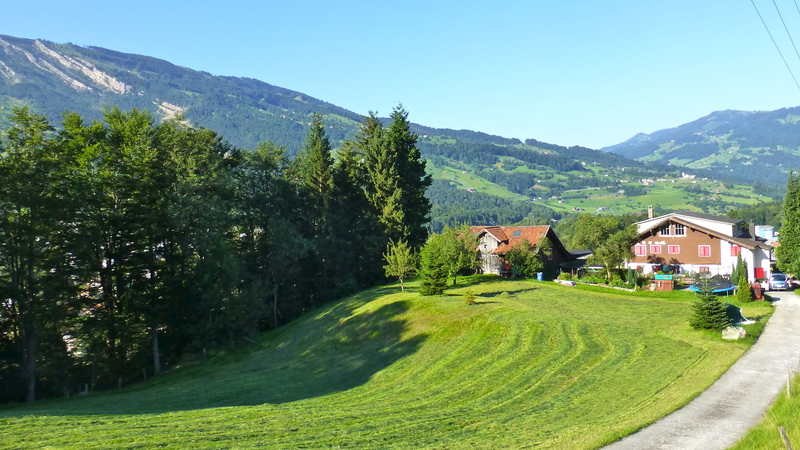 All too soon, it was time to return, by the blue cog train… down, down for 6.8kms at a maximum incline of 20%, through forests and farmlands to Arth Goldau on the Zugersee side of the Rigi. 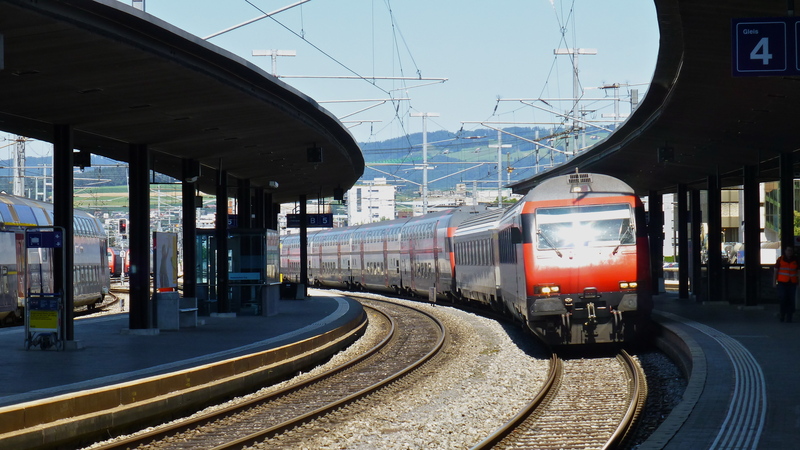 After a truly memorable day, it was time to make the most of the Swiss transport system again; from the station at Arth Goldau at the bottom end of the Zugersee, we took a train through the village of Walchwil to Zug, another train to Zurich and finally another to the airport – all well co-ordinated! We had a a quick cafe meal before making our way through the ‘airport city’ to our hotel – and bed. And there we crashed. It had been a long, busy but fulfilling, ‘WOW’ sort of day!